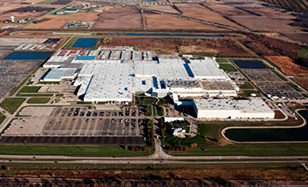 Tokyo, August 1, 2016 – Fuji Heavy Industries Ltd. (FHI), the manufacturer of Subaru automobiles, today announced that Subaru’s total vehicle production in its U.S. plant, Subaru of Indiana Automotive Inc. (SIA), has reached 3 million units. The 3 millionth vehicle, a 2017 Subaru Outback in Lapis Blue Pearl, rolled off the production line on July 28, 2016. The blue Outback represents nearly 27 years of Subaru’s auto manufacturing in America since the facility’s start of production in September 1989 with the Legacy sedan. SIA currently builds the Subaru Legacy and Outback models mainly for the U.S. and Canadian markets. The plant also made the Subaru Baja and Tribeca in the past. 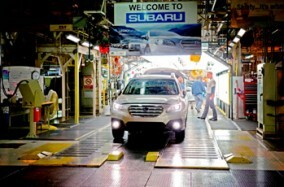 In 2015, SIA produced a record volume of 228,804 Subaru vehicles, up 18.5% from a year ago. To keep up with growing sales in North America, Subaru will increase the annual capacity of SIA from 218,000*1 to 394,000*1 units by the end of this year. The capacity will further grow to 436,000*1 units in fiscal year ending March 2019. SIA will begin building the Subaru Impreza late this year, and will add Subaru’s all-new 3-row crossover vehicle to its production line-up in 2018. SIA was the first auto assembly plant in America to achieve zero landfill status, and SIA’s entire site has been designated a Backyard Wildlife Habitat by the National Wildlife Federation. *1: Annual capacity figures are on a standard-operation basis. *2: SIA was originally established as Subaru-Isuzu Automotive, Inc. as a joint venture between FHI and Isuzu, and was renamed to Subaru of Indiana Automotive, Inc. in January 2003 when it became a wholly-owned subsidiary of FHI.